Noordwijk is a bracing North Sea seaside town and golf has been played amongst these Dutch sand dunes since 1915 when the Noordwijkse Golf Club was formed. A housing estate now occupies the original layout. In 1959 local approval was granted to build a new 18-hole layout using a course routing drawn up by Noordwijkse club member, Paul de Jong. The plans were rubber stamped by Ken Cotton in 1960 but due to years of permit negotiations it took another nine years before construction work started. Eventually, in the early 1970s, a new 18-hole course, once again set among the dunes, was ready for play. Undoubtedly, de Jong shaped a classic course through this undulating linksland with each hole winding its way through the sandhills and (in a Formby-like style) through pine woods at holes 4 to 7 then 11 and 12. The Dutch Open has been held here nine times and winners include Seve Ballesteros (1986), Bernhard Langer (1992 and 2001) and Colin Montgomerie (1993). 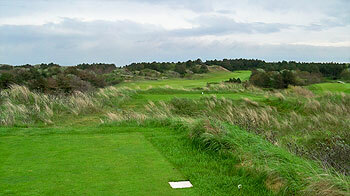 Noordwijkse is a tough pure links test, which stretches to 6,317 metres from the back tees. Noordwijk is one of three links courses situated on this stretch of Dutch coastline… Kennemer (Zandvoort) and Haagsche (The Hague) complete the triumvirate. Noordwijkse was my first stop of a 3 days and 5 WALKING rounds in Amsterdam invited by my good friend DD after 3 rounds in Spain and 6 in Portugal in 8 days. Although I am a marathon runner, I was tired and the Netherlands Journey got every single calorie left out from me. But I loved every single meter walked of it and found 5 excellent course, 2 of which I am sure deserve a top 100 spot, 2 other would be top 200 (this one for sure). It was a very early round on a semi sunny day which started with some morning fog, almost no wind and no cold, ideal conditions. And all the same I was beaten by the course, as DD said I had to play everything from the very back ... And Noordwijkse can be a monster from there! Course has a piece of land close to the ocean, with sandy dunes and only some trees in 3-4 holes. It is a true links, extremely challenging and with many good holes. I found 2 "negative" aspects only: most of the back tees make you walk back and up the dunes which adds extra physical demand. This could be solved with some minor changes. And greens were in not good shape which after coming from 8 days playing at 10feet perfect greens was a brutal change for me. About the course ... this one could be located anywhere in the UK!!! The only difference was the Club House, similar in style to that one at Hillside or Birkdale. - 600yds par 5 2nd up the hill ... drive/drive/6iron! - 480yds par 4 4th up the hill again driver/hybrid! - short par 4 7th dogleg left with some trees on the right side, great hole! - long par 4 10th where a good drive can give you the advantage of getting to the lower part of the fairway. - short par 4 13th with the false front is one that got me! - 18th is a monster from the back, another hybrid as second shot. It was a very good start, surprising and more than I expected. Trust me, these 5 courses I played can make an amazing golf tour together with touring the cities here. And for sure Noordwijkse can be set to extreme championship conditions. Of course, experienced hands of a good architect can turn this one easily into a top 100 course. Some routing changes, lenght really not needed and maybe some green complexes re thought and you have a world class venue. I was really excited about playing on a course that sits in amongst some of the most spectacular sand dunes in Europe if not the World, the land is perfect for an unbelievable course. But I’m sad to say that I think the course makes the worst of a great situation, I left the course feeling so flat. I was expecting a course that could match, maybe not the best, but the very good links courses of the UK & Ireland, I’m sad to say I don’t think it even comes close. Firstly, the quality of the playing surfaces was really poor, most specifically the tees & greens. This could be a seasonal thing so something tough to judge with just one round, but, I felt like I was playing in a meadow. Lots of lush green grass, daisies, slow, and so out of character with how a links should be. If also feels like there is way too much ‘green’ vegetation on the course which just look so out of place, the trees to the right of the 2nd over the hill is a case in point. A complete removal of all trees & bushes would really help. The greens were very unlinks like, not much movement, small, pretty flat and lack any sort of character. The holes within the pines just don’t work, they break up any flow and the playing surfaces become so inconsistent with the rest of the property. It works at Formby but doesn’t here. The 12th is a dreadful par 3. Lastly, the major disappointment was the cart path which got to within about 3m of the green on the par 3 3rd. Any decent course architect would have a heart attack at seeing that. If all of the trees were removed the path could be rerouted around the back of the ridge on the left. It could be such a great little hole. That sums the place up, it could be an awesome course in the perfect setting, but there is unfortunately so much wrong. No doubt there are some spectacular holes (10 springs to mind) but they are the great exception rather than the rule. Noordwijkse Golf Club receives the award for the greatest missed opportunity in The Netherlands. The club is so fortunate to have some of the greatest linksland in the world and due to extremely mediocre architecture and lack of vision somehow managed to create a penal above average course with 12 raised, small push-up greens. I realize this is a huge contradiction to my original review from many years ago. There is a simple answer for that, with years of architectural study and spending time learning from the great living architects and debating relative merits of what makes courses and architecture great along with visiting over 500 hundred courses for study my opinion has reformed considerably. This is not to say that Noordwijkse is not a good course. Not at all. Many visitors leave thinking wow, that was great and so hard and so penal. The beauty can easily mislead. Many very strong players leave relishing the challenge that the small push-up greens bring however, for 95% of the members the course is far too difficult and their lack of knowledge leads them to believe that’s the way golf should be. However, jumping on a plane to England, Scotland or Ireland is a sure fire way to see what’s possible and how easy it would be to make the most of this wonderful landscape and create a highly playable course that could be significantly more appreciated by the members, be far more fun to play, far more playable for all hcp levels and even provide a greater challenge to the better playing members. To be very specific the following points all deserve to be improved allowing this course to rightly take it's place among the world's best as would be expected with a course occupying such a magnificent piece of coastal links-land. The greens and surrounds all need to be completely redone. Greens should be significantly larger and allow for multiple pin positions as well as the ability to use the ground game and bump the ball onto the greens. They should also be tied into the surrounding dunes to look natural and as if they have always been there, i.e. just found like that. The bunkering must all be completely redone and reshaped. While this aspect of the course has been at best mediocre since the original design in the last few years bunkers were reshaped to almost perfect circles which in absolutely no way work with the course nor do such a course any justice whatsoever. Keep in mind however that there are very few bunkers on the course and I'm not saying the course need a lot more bunkers as this is not the case. They just need to be redone and look a lot more natural. The fairways need to be firmed up and width brought back into them. The current driving range is an eyesore and too big a distance from the clubhouse resulting in the fact that it not frequently used by members yet interferes with the 1st and 9th hole. There also needs to be a solution for the long and unnecessary walks that occur after the 5th, 6th and 7th holes. This will require the 6th hole and likely the 7th holes to be completely rerouted. However, this will bring back a much better flow and continuity in the walk. Having a long walk while not ideal is also not unheard of on great course. Think of the walks at Barnbougle and Fryer's Head. However, these long walks have something very much in common, both are along the ocean and both are leading to great holes. The 6th and 7th holes at Noordwijkse are disaster holes that add little to the course and render the long walks far less than ideal. The routing of the course requires constant walks back and up on top of small dunes to reach the back tees and this helps make stroke play rounds and competition rounds last up to 5-6 hours for the best players. Sure great exercise with all this walking back and up however, so is a treadmill. The club is now working hard at removing the trees which are uncharacteristic of the land and also pine trees that come from Spain or Cyprus or some other warm land. For the course to reach it's full potential all these trees will need to be removed to unveil the wonderful natural dunes landscape that finds itself in the forested holes (4-7). The 12th hole could well also stand to be removed with a renovation, unless the wind is up this hole for a drop shot par 3 provides very little interest. This could however be changed with a new green and surrounding area. 14 is another hole that from an architectural perspective could be far better. Finally the 18th hole provides yet another dilemma requiring the player to walk the length of a par 3 back to the tee box which resides by the 15th hole when played from the back tees. All in all the good news is that it will not be hard to make huge improvements to this course while at the same time giving this wonderful links land the course it deserves. Watch this space in years to come, as there are significant movements in the right direction. I for one am keeping my fingers crossed. When I’m coaching the youth football team, I tend to judge my own son more harshly than the other kids. I guess it’s because I care about his game more than the others and because I always feel he can offer more. While there’s always better and always room for improvement guess I should try harder to focus on those qualities he does bring - and remind myself that he is in the first team after all! I and my friends play Noordwijkse most years on our annual golfing trip to the Netherlands and love the course just the way it is! The holes routed through the trees are a beautiful contrast to the stunning dunes on the rest of the course. I sincerely and respectfully hope your dreams do not come to pass. Reading this review leaves me wondering how a course with "so many faults" makes into Europe's top 20. Looking forward to playing there again this summer and enjoying the warm friendly hospitality and a cool lager in the clubhouse. Reg, thanks for your response. Happy you and your friends enjoy playing the Noordwijkse. There are many people that love the course as the setting is wonderful for golf in general. If we can agree that great architecture makes the best use of the land available as an initial premise then you and others can start to understand my comments in the right perspective. First of all, I've played well over 1000 rounds at the course so know it fairly well and I've had the pleasure to walk the course with some of the world's best architects and learn from their comments. Noordwijkse is situated on the best linksland of continental Europe, that alone is enough to put it into the Continental European Top 20. Golf in Continental Europe for the record is relatively very weak in comparison to our neighbors across the stream in the UK. All the best courses not surprisingly were designed by the great Golden Age architects from the UK. Colt, Simpson, and Alison, take them out of the picture and there would not arguably be a course worth visiting for architectural significance in Continental Europe (in my opinion). That doesn't mean there wouldn't be courses with nice views where you could have a good game and a cold lager. Most people only care about that. Noordwijkse is an example of a course set on an A+ property with a very poor design that results in perhaps a B overall grade which when seen on a global scale is indeed great. As a member, I'm hoping for an A+ course on an A+ property that is incredibly fun and challenging for all our members. Ask any competent architect and they will give you a similar answer. Right now, as good as it is, as hospitable as the members are and as cold as the lager is, the course is a missed opportunity in relation to what it could and should be. Hi David, without agreeing or disagreeing, I'm interested to learn what made you change your mind (more or less) about the quality of the architecture over the last couple of years. I would love to see for myself! Does one need a member to introduce a visitor? I will be in the area mid June 2018, if a proud local cares to show an afficionado around. Without doubt Noordwijk has the most natural piece of land of all the courses I played in Holland. It has an uninterrupted relationship with nature, where the only distraction is the beauty of the rolling sand dunes. It quite rightly has a reputation as the toughest course in Holland, and with any element of wind, this status comes to the forefront. The journey across the property brings you to wonderful vistas and hugely emphasizes the ground game from 100 yards and in. There are visual disappointments from the first and last tee boxes where the practice ground and a car park respectively get into your line of sight. This highlighted some weaknesses with the routing in places. The variety of holes brings golfers from exposed links sand dunes to a handful of tree-lined fairways at the back-end of the property, which added a welcome sense of charm – but these trees must be pruned to ensure the charm doesn’t evolve into suffocation. Prepare your golf game to be put on trial as the course asks dozens of very tough questions as you traverse a property oozing with great potential. Let’s hope in the coming years that appropriate modifications to the routing are supported by the club and local government so that the architectural merits can be realised like never before. Noordwijkse was the first of eight courses that I played last week on a short visit to the Netherlands and it established a very high standard for the trip. I can understand why it’s been dubbed a “dunes course” (as opposed to a links course) because many of the holes weave in and around the towering sand hills that proliferate along that particular stretch of the coastline. Fairways played firm and fast, with plenty of opportunities to bump and run around the greens, even for those that were raised. The opening tee shot from a high, exposed teebox next to the clubhouse sets the tone for the round right from the off, though playing your first shot towards the practice area doesn’t offer the best of visual targets. Then, just as you’re getting into the rhythm of the round on the links terrain, the routing suddenly veers into the woods at the 5th, where the tree-lined hole doglegs right and down to the green. This short interlude away from the main links action at the most easterly portion of the property ends at the short par four 8th when you emerge from the pine trees at the short par four 8th, playing left and down to a green that sits in a lovely little dell, surrounded by bunkers. One hole later and you’re back at the clubhouse, where the 9th green tilts significantly from back to front. The back nine is solid, with probably the best hole appearing early on at the uphill 11th, where the fairway rises gradually to a raised green that’s framed by sand hills and pine trees. The toughest hole for me (though its degree of difficulty is not reflecting in a benign stroke index of 14) was the right doglegged 15th, played totally blind off the tee across a group of intimidating sand hills. If I’m being ultra-critical, some of the bushes and small trees close to the fairways on the more open holes could be removed, affording the course more of a proper links aspect, but this objection to extraneous vegetation could equally apply to the other two top rated coastal courses that I played in the days following so it’s not just Noordwijkse that could maybe benefit with a bit of an agronomic tidy up in that regard. There’s a very relaxed vibe in the clubhouse, where it’s plain to see that members are proud of their club and their course – as they should be – but they’re not hung up on keeping the place entirely to themselves, even though it is a private establishment. It’s always nice to be made welcome as a guest and to feel like you’re accepted on the same level as those who play here all the time. Exiting and challenging course. Beautifully maintained and very difficult. I have been working in Holland for a number of years now and had the please of playing a number of courses including Hilversumsche and Rosendaelsche but the Links courses are the ones I am aiming for now and if Noordwijkse is a taste then I can't wait to get to Kennemer and Koninklijke Haagsche! I received an invite to play Noordwijk in July 2012 from a member who just happens to work colleague and I jumped at the chance. The clubhouse was warm and welcoming although the practice facilities are some distance from anywhere right now but adequate (I was told there are big changes with the local council right now who the club leases the land off to move the 1st tee to bring the range closer...). Moving to the course I have to say that this is one of the finest courses I have played, although it is clearly laid out on links land it is really a mix of Links and woodland. The benefit of playing with a member was very much needed as this is a really challenging track and the naturally undulating terrain made the picking of a line difficult on a number of holes without someone to point you the right way. The par 5's are particularly strong and even the shorter par 4 demand great ball control to stop balls on hard, fast greens. An absolutely superb course and I am already lining up another round already for which I can't wait! Astonishing golf course! From the moment i got out of the " forest road" into the Club area i knew i was going to spend one day into a special place. Great views, superb manteinance, perfect greens also very, very fast and a terrific golf course under every aspect! My preference goes to holes number 2,3,6,11. Very happy to know that hole number 1 will be relocated, now its not high class level like all others holes due to the tee shot view with driving range on target! Played Nordwijkse Golfclub on Thursday May 10th at 1:40 PM from the back tees with David Davis, Top 100 Benelux correspondent. This was my third golf club played in my four club tour of the Netherlands. Played Utrecht de Pan on Tuesday, Koninklijke Haagsche on Wednesday, and Kennemer Golf and Country Club on Friday. I must say playing these four clubs was a great golfing experience and would certainly recommend this rotation for any golfing enthusiast. All were excellent tracts and can understand why they are the top four ranked golf clubs in the Netherlands. I would say Nordwijkse is my top pick of the four golf clubs, however, not by much as all were excellent. I thought Nordwijkse had the best greens of the four. The colonial bent grass greens at Nordwijkse are a cool-season grass that thrives in cool coastal areas and is native to Europe. This same colonial bent grass is used on many of the excellent golf clubs in the Pacific Northwest and Northeastern United States. To be fair, de Pan and Koninklijke Haagsche were both aerated and top dressed when I visited, so cannot give a truly objective opinion. But I do know Noordwijkse has excellent greens. The greens and fairways were firm and perfectly manicured and the tees and bunkers were all in excellent condition. One oddity at Noordwijkse was the location of the driving range which had to walk down the first fairway to get to the range. David showed me where the first hole is going to be relocated and it looks like the new location in the sand dunes will make the new hole one of the top opening holes anywhere. The range is also going to be relocated which will remove this oddity. The current first hole is a solid 353 meter downhill par 4 that is a slight dogleg to the left with the green guarded by bunkers on the right front and left of the green. The second is a strong three shot 547 meter par 5 that requires accurate shots to reach the green in regulation. The third is a 152 meter par 3 that has a two-tiered green. I thought the 423 meter par 4 fourth was the most difficult on the links as long and accurate shots are required on this hole. The 377 meter par 4 fifth was a dogleg right that requires a drive down the left side of the fairway to see the green on the second shot. The downhill 171 meter par 3 sixth was a nice hole with a relatively smaller green. At this point there were some pine trees that seemed to be out of place in the dunes. David explained that the Germans planted a long line of pine trees in this area to keep the sand from blowing on the farmlands. The seventh was a short slightly dogleg left 331 meter par 4 that requires an accurate tee shot with two bunkers guarding the right front side of the green. The eighth is a 369 meter dogleg left par 4 that requires an accurate tee shot and unless the drive reaches the top of the hill will have a blind second shot. The ninth is a strong 509 meter par 5 that played into a strong wind on the day we played and was a solid three shot hole.